As I reflect on that quote and the competencies required of individuals to change the world in this way, I am reminded of how educating young people can play an important role in developing a truly global society. I see 3 competencies that are vital: ethics, communication and action; with this comes the need to understand multiple perspectives and cultural differences/similarities. What does this look like in elementary school? How do we develop empathy and as Jason Silva mentioned in The Big Picture, extend our gaze to develop a massive transformation of consciousness? I hear it everywhere… the purpose of education is to foster the ability to think critically and develop skills to be a productive member of society. But, I have also heard (especially in this age of high stakes testing) that the purpose of school for your children is to develop basic skills. Students absolutely need basic skills, but can’t we help students acquire those skills in ways that build a moral compass, empathy, communication and the desire to act? What I very much appreciated in the article Setbacks Aside, Climate Change Is Finding Its Way Into the World’s Classrooms by Beth Gardiner was the idea of focusing on, “the “handprint” of individuals’ beneficial actions, rather than the harm suggested by an environmental footprint.” I sometimes worry that through news and current events we are depicting the world as very scary and unjust. Yes, we absolutely have many inequities and global problems, but I think if we start using the lens of what “handprints” are being left and what can we learn from those actions we might be able to turn some of these injustices into better learning opportunities for ways our young people can act. On Wednesday, my class participated in a Google Hangout with Paul Salopek, a Journalist with National Geographic who is walking around the world for 7 years, following the path of early migration. If you have not heard of the Out of Eden Walk, check it out. And, as an educator check out Out of Eden Learn through Project Zero at Harvard. It has been a great way for my students to connect their world with students in Dubai, Australia, and Eastern United States (the countries represented in our walking party). But, back to our Hangout with Paul. One of his messages was human kindness is everywhere. He stated, ”I’m being passed from kindness to kindness”. We have to remember this as much as discuss global problems. Another way that we have focused on the “handprints” we can leave is when we studied teen activists. I got this idea from Lucy Calkins’ Units of Study in Writing . While students were reading about such issues as slavery, girls who weren’t allowed to go to school due to radical leaders and religious beliefs, or child labor, the focus that there were people out there acting and making a difference was powerful. Yet, while I was hoping they would be inspired and choose to act (I felt like I shouldn’t force them to and I’m not sure if this was the right choice), they have not done so yet. My question is how do we move from knowledge about global problems to acting to change and rid the world of those problems? As I think about that, while they showed a desire to act, they have no idea how to start. We are starting small. This next week, students will be choosing one thing that they can do to make the world a better place. It can be small or large, but they need to commit to something. We will see how that goes, but I really want it to come from them, so I’m still thinking through this aspect. Unfortunately, inequities are not just a global problem, they are a problem in our schools as well. When Gordon Brown spoke about how Olof Palme desired to abolish the poor and to let everyone have the chance to realize their potential to the full, it made me think about all the inequities in our schools: tracking, access to technology, access to powerful teaching and learning, etc. How are we doing at providing equitable learning experiences to all our students and are we providing all our students the chance to realize their potential to the full? This reminds me of a blog post I just read by Kristin Gray, a math coach on the east coast, regarding RTI. I agree that we have to develop strong interventions for students. It is vital, but are we being equitable and just in how we are doing it? This is an area we need to focus on. The article Money, Race and Success: How Your School District Compares was yet another reminder of this. We need to do a better job. One way to improve equitable access to learning is through global education. When we provide all students with opportunities to interact with others and understand multiple perspectives, in addition to learning how to communicate in person, in writing, and online, while also developing empathy for others and providing all students with rich, relevant, meaningful tasks that foster critical thinking skills, we will be one step closer to developing a more just and equitable educational system and improved global society. Ahhh…always more work to be done. I love when I can turn travel into a math lesson. On December 26, I had an urge…an urge to travel, so I jumped onto Kayak to see where in the world I could go that would be a decent price. Ecuador? Nope…too much. Japan? Whoa…this might be it. Leave tomorrow? Sure, why not? So I went for it. I booked my flight and was ready to go. “Yes! Yes! Yes!” was all I could say. Short story…we booked her a flight too! On December 27, we were off on our adventure to Japan. For the global wanderer in me, I have 3 words…I love Japan! I never knew I would, but I am definitely going to go back there and spend some time observing schools and learning about their educational system, especially math instruction. I have always been fascinated, but now I HAVE to do that! Well, our trip was amazing, but when I can combine the mathematics that my students are learning with a trip, it makes it even better. First idea…travel distance to Japan using rates. We had just started working on ratios before I left on the trip, what a perfect introduction to unit rates using miles per hour. My plan…make it a game. Where in the world did Ms. K and Ms. S go? Giving students the average speed, the time to travel, they can determine the mileage. We will do a little noticing and wondering. 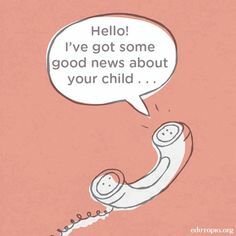 Have them determine what information they might need. Then I will give them the data and off they will explore. After they figure out the mileage, I will give them maps and they can try to guess where we went using their knowledge of ratios. My goal will be for them to understand what a rate is and how unit rates can be useful. I definitely made it complicated, but complexity is what makes it fun and my students would not expect anything less. See the video below. We had no idea how much it was. All the rest of the coins had the value shown, this one did not. We finally finished and paid. Ahhhh, what did we get as a change? Yes, the unmarked coin. We paid with 2,000 yens. The bill was 1,682 yens. Our change…. The unmarked coin is worth…. This will be a perfect warm up to keep working on writing equations with variables. Yay! Lesson learned…staying home is relaxing, but traveling is fun and inspirational! Where will I go next? It was an interesting word for me. I believe whole heartedly that teaching and leading is so much more than being a technocrat. Then I started reflecting…Crap! I only wish it was this cold! Am I spending enough time building relationships with my students, laughing with them, developing an understanding of their cultures and their desires? I know I want to. I know I am trying. I know it is important to me. I know it is a goal that I have. But, am I executing this? Or are the technical components of the job taking over? So, relationship building is important, but the reason I need to do this is for the ultimate goal of developing my students’ processing skills to be independent learners. 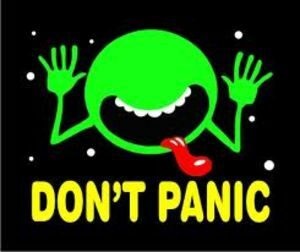 How do I forget the pressures (inner and outer) of achievement that cause panic and stress and focus on my students and growing their brains? I know my students need to connect with me. I know I want to connect with them. I see them wanting to come in and hang out before school, recess, and lunch time. Then I hear the words, “Go play!” escape out of my mouth. I want to hang. I want to play. But, I am just full! I am spending every waking minute creating lessons, trying to keep up with providing feedback (I am so terribly behind on this), and planning a rich curriculum to make sure that I am addressing all the complex standards that my students are required to learn this year. I am full! ihave a team of grade level teachers that I am suppose to meet with. We have a staff meeting once a week that I must attend. My introverted self is in need of space. I am full! And while I am spending the bulk of my time on the planning, meeting, and technical thinking, I am still so far behind where I need to be. I am full! But, my students need to connect with me. We started the year building academic mindsets and understanding why we are in school. We started the year getting to know one another. We are doing great things, but it is never enough. What would happen if I create space: space for me, space for them, space for us? I have seen myself in the top two categories. By goal, the stay in the top left. What do I need to do? Can I forget about some of the technocratic minutia this week and focus on us and our humanistic needs? How can I give them access to me during recess, lunch, or before school without taking away the much needed alone time that I need? How can I give them the support to develop the processing skills they need to be active and competent learners? Can we make our reflection time sacred, instead of finishing up social studies, or science during that time? Yes! That will be my goal this week. I will not go backwards, but I will start where we are. I will not skip our two afternoon meetings on Tuesday and Friday to discuss how the class is going and develop next steps for our learning. I will open the classroom during two lunch breaks for students to hang out so we can connect and I can make sure I understand their needs. I will make my students hold the cognitive load in my class and not me, by having them inquire and develop the questions that lead our study. 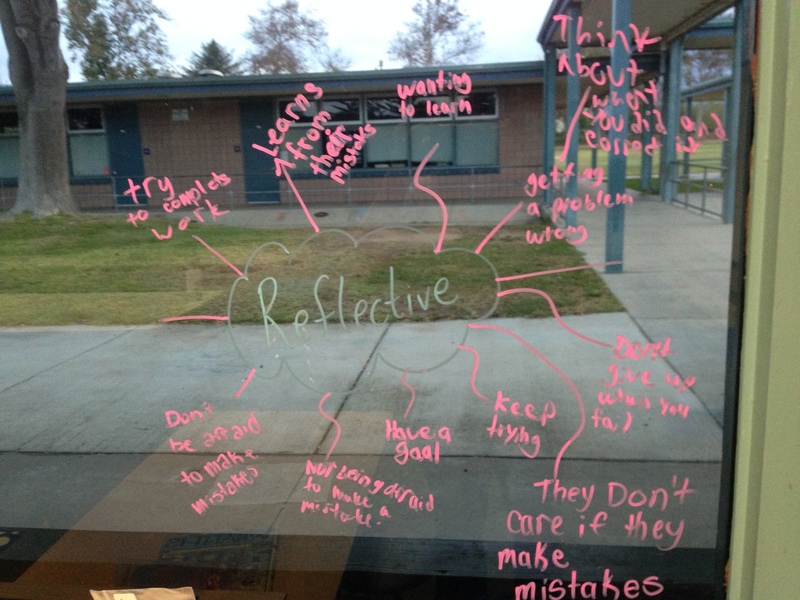 I will give students time on Wednesday for personal reflection and goal setting. We will connect our study on cells back to the brain and what our brain needs in order to learn. Let’s see how the week feels after a little more “personal warmth” and a little less “professional distance”. ****Update**** Well, it has been a work in progress. I have successfully met(and still working on) goals 1, 4, 5 and 6. I definitely need to make more effort on 2, 3. Work in progress. How do you find balance between the technical sides of teaching and the time to build trust and relationships with students that we all know are vital components to success? I HATE all the “bribing” happening in schools. You read and you get a party. You do your homework and you get a party. You complete all your work and you get a party. How about you GET to read, you WANT to learn by practicing at home, you WANT to complete all your work because you are interested and see value in learning. Let’s not underestimate kids. Let’s get to know them, help them see the purpose of schooling, the love of learning, the enjoyment in books, and the creativity in math. I know it is hard, but if we always just use tricks and bribes, will we ever get the intrinsic desire to learn that we all need? I know there are some kids that need that extrinsic motivation at first, but I just think it is becoming too much the norm. It is becoming a crutch instead of a scaffold and I think we need to stop. Let’s create thinkers who love learning! I am determined to break this cycle and help my students develop strong academic mindsets that will help them to have long term success in school and in life. One of the things that we did at the start of the year was to learn about the Global Campaign for Education. We graphed how long it took us to get to school, and then watched the documentary On the Way to School. Later, we compared our time and distances to the 4 stories. This was a true eye opening experience for my students. We discussed why the children would travel such far distances just to go to school. We also completed all the lessons from Lesson for All Curriculum. It was powerful for my students to learn about the barriers to education and then to think about what people are doing to the lessen those barriers. I now have students working to figure out how they can support and reduce the barriers for students around the world. Through this work my students were the ones that brought up the topic of attitude and students were saying it is not just about going to school, but it is what you do while you are there. Yes! They said, “Distance is a barrier to get to school, but attitude is a barrier to achieving in school.” Awesome! They said it and I’m using it. Do you have the right attitude? Are you mentally here and engaged? If not, what can you do to change your attitude? In addition, we started the year with Jo Boaler’s Week of Inspirational Math. Brilliant! We learned about growth mindset, the notion of brain crossing, growing dendrites and how mistakes can cause synapses to fire. (This is also linked to our study of cells and neurons) Students saw that through effort, they can learn and challenges are important. And….they are just loving math! They are seeing the fun and creative side to the subject, engaging in argument, and becoming pattern seekers. Yesterday, while I was reading a book in which the author states that her least favorite subject was math, the class looked at me appalled and in shock. Yes! They are all starting to love math. 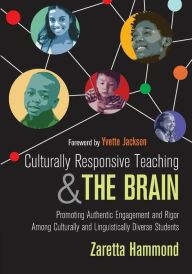 I was determined to do a better job of being more culturally proficient and helping all my students develop strong academic Mindsets and being the “Warm Demander”. This is from her website and I am on the road to #1, #3 and #5. I wanted to start the year by building strong relationships with my students. So, I decided to share part of my culture with them and I set up a Fika or a walk (some people talk more when they walk) with each student. We talked about how they felt about different subjects, what their afternoon schedule is like, and their interests. We then created a special handshake. Yes, I now have 26 handshakes that I have to remember as they all enter the room each morning. I admit it, I don’t always remember them. But, I will get there. I want them to leave my class as learners: inquisitive about the world and motivated to find out the answers to their questions. I’ve been told that I should journal more times than I care to admit. Yes, I have a need to sort through all the thoughts. Yes, I tend to share my thoughts with the people I work with. Might they not want to receive my plethora of emails with my ideas or my “thesis” as one colleague put it? Hmmm… I can understand how the answer to that might be a yes. But…journaling? It just seems so wasteful to write all my ideas down for only me, myself and I. So, in enters blogging. At least there is a chance someone out there might read it, comment about it, engage in a conversation about my thoughts. 1. I can’t seem to last more than a few years in any one position, school, or city. 2. I am not just interested in one subject or one component of teaching…I drift. 3. When I grow up I want to be a nomad and just travel from one place to the next. What will this blog entail? Not quite sure. But, I will guarantee that it will be nomadic, drifting from one idea to the next and connecting it all together: learning and the brain, math, global competency, writing, science, ridding the world of bad homework and summative grades that are not conducive to student learning, cultural proficiency, technology, engineering, and maybe even a little reading. 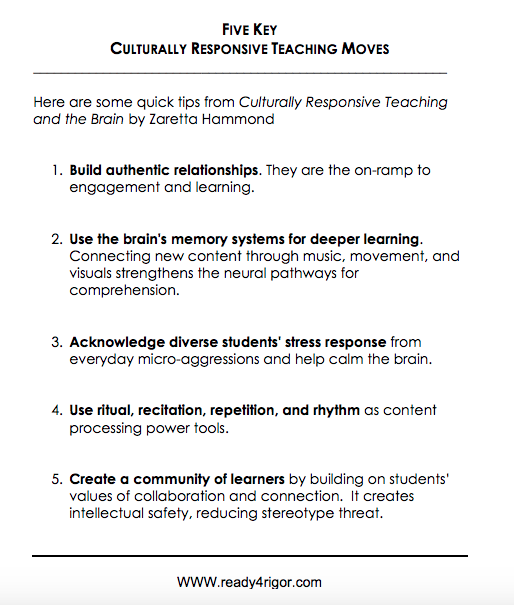 I have been completely inspired recently by Zaretta Hammond and her Book: Cultural Proficiency and the Brain, every single component of Cognitively Guided Instruction (How can you teach without understanding how a student thinks and knowing what they know? Read all 3 books if you have not! ), CCSS in Math- the battles, the challenges, the increased understanding that teachers have to have in order to teach it, Lesson Study (One day I am going to go to Japan and see this in action) David Perkin’s FutureWise: Educating our Children for a Changing World, a More Beautiful Question by Warren Berger, Sandra Kaplan’s work about Depth and Complexity and Universal Themes (thanks Joanna! ), and Global Competency (bring in the Asia Society), NGSS and this notion of starting with Phenomena and creating models, and finally the entire Maker Movement. Let’s create! My goal as I enter my 16th year of teaching (man, I sound old) and back into the classroom after a 2 year hiatus as a TOSA is to create a program in which students are engaged in “life-worthy” learning, questioning, using (not just obtaining) knowledge, making and creating, understanding multiple perspectives, collaborating and problem solving, developing a sense of self and developing an understanding of our greater world. I want to engage my students and myself in learning that is deep, relevant, and long lasting. So here goes…back to the classroom, back to 6th grade. Let’s do this!